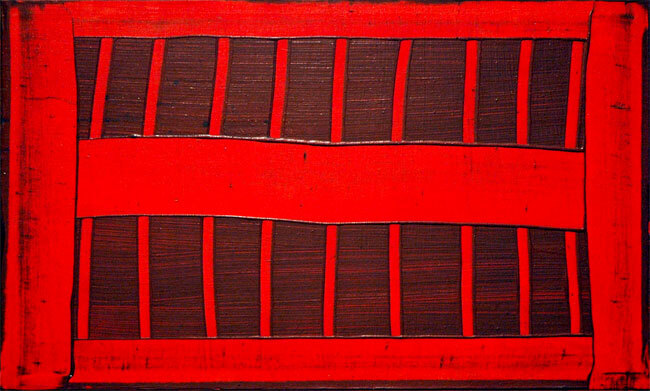 Mary Heilmann The First Vent 1972 acrylic with bronze powder on canvas 20" x 32"
I found a lot of treasures in the "WACK! Art and the Feminist Revolution" show when it made its stop at at PS1 last spring. Maybe I'm stuck on her aesthetic, but Mary Heilmann's work, not surprisingly, looked to me like some of the freshest and most beautiful things to be found on the two large floors of galleries. Besides, it really lightened up my week as I going back over some of the images I had wanted to post much earlier, and after my last few entries it looked like I needed some light. This acrylic was done back in 1972, when all we had to worry about was Nam and the bomb. After another look at Heilmann's painting and its title, while finishing the two paragraphs above I realized that the idea of the representation of ventilator screens of any kind started to possess me, as it had more than once before. I remembered Doug Wada, who has used quite plain vents as the subject of a number of his trompe d'oeil paintings, in addition to this somewhat-less-generic A/C screen, but I know there are many others out there. Who can't use more ventilation, even if only imagined? This thing probably started with the Romans, where the tradition continues. \n\nI found a lot of treasures in the \"WACK! Art and the Feminist Revolution\" show when it made its stop at at PS1 last spring. Maybe I'm stuck on her aesthetic, but Mary Heilmann's work, not surprisingly, looked to me like some of the freshest and most beautiful things to be found on the two large floors of galleries.\n\nBesides, it really lightened up my week as I going back over some of the images I had wanted to post much earlier, and after my last few entries it looked like I needed some light. This acrylic was done back in 1972, when all we had to worry about was Nam and the bomb.\n\nAfter another look at Heilmann's painting and its title, while finishing the two paragraphs above I realized that the idea of the representation of ventilator screens of any kind started to possess me, as it had more than once before. I remembered Doug Wada, who has used quite plain vents as the subject of a number of his trompe d'oeil paintings, in addition to this somewhat-less-generic A/C screen, but I know there are many others out there. Who can't use more ventilation, even if only imagined? This thing probably started with the Romans, where the tradition continues. Published on August 7, 2008 1:01 PM.